Rugged Radio with Powerful Audio! Icom radios are built tough, and the IC-U80. This military rugged rig offers water resistance and superior protection against dust and dirt (IP54). 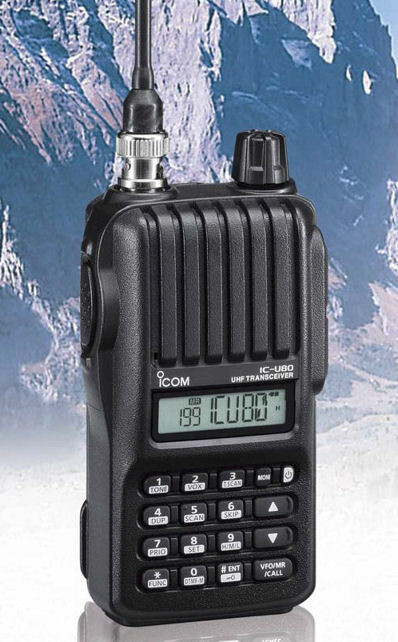 Compact, rugged and with plenty of power, the IC-U80 is ideal for basic, on-the-go UHF operations. The IC-U80 uses the BTL (bridge-tied load) amplifier that doubles the audio output. The 36mm large speaker delivers 750mW of loud and intelligible audio*. Great for noisy environments. The IC-U80 offers a just-right mix of power and size. 5.5 watts of high power will work to get your message through. Get up to 14 hours of operating time with the battery pack (BP-264). All that power comes is an easy to hold and use size – not too big, not too small. The dust protection and water-resistance equivalent to IP54 provides reliable operation for practical outdoor operation. The IC-U80 tested to and passed 11 categories of MIL-STD-810 environmental tests. The IC-U80 has a total of 207 memory channels, including 200 regular channels, 6 scan edges and 1 call channel. The channel name is programmable with 5 characters for easy recognition. The IC-U80 has internal VOX (Voice Operated Transmit) function for convenient hands free operation with a compatible optional headset and plug adapter cable. Also, the VOX gain and VOX delay time are adjustable. Rapid Multi-charger for BP-264 or BP-265. *Battery pack compatibility differs depending on installed charger adapter (AD-120 or AD-121). * Either AD-120 or AD-121 charger adapters are supplied with the BC-197, depending on BC-197's version. * BC-123SA/BC-147SA for 120V AC. SE for 230V AC. SV for 240V AC. For use with BC-191, BC-192 or BC-193.